A simple hat for kids’ simple needs. Crushable, floatable, water and stain resistant, removable, breathable, and—oh yeah—adorable. They don’t even have to know it’s sun protective, but you’ll have that peace of mind. With its go-everywhere design, kids won’t forget their Fun Bucket. Hold your hat on, but don’t let it hold on to you! 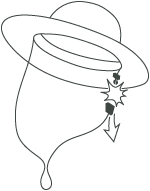 The SmartStrap™ keeps your hat in place, but will break away safely if given a good tug. The year is 1982 and the founders, young and full of energy, start their lives together on ranch in California. They strive to live their lives 'off the grid' and in harmony with the earth. 1986 saw the beginnings of the business with an all weather picnic blanket, produced out of the need for dry backsides. The 'Adventure' blanket. Wherever they go the blanket gets noticed, so they are inspired to make a venture of sewing and selling the Adventure Blankets. In 1992 the Sunday Afternoons brand is born! By 1994 with blanket fabric scraps piling up, they decide to sew them into sunhats. This is an immediate success and by 1996 they had perfected the Adventure Hat with UPF50 fabrics and many protective features. In 1999 the wholesale business is launched in the following years many more hat styles are born. 2017 we celebrate our 25th year in business with the launch of the Heritage Collection. With business growing we look forward to outfitting the adventures of outdoor lovers everywhere!